A SWAT raid of a home near a Nipomo elementary school Friday morning produced guns and drugs, both of which were for sale, according to the San Luis Obispo County Sheriff’s Department. Following the “high risk search,” deputies arrested two Nipomo residents on a host of charges. The search stemmed from an investigation into a March 23 shooting in Grover Beach. That day, a handgun was brandished, and shortly afterwards shots were fired, a sheriff’s office press release states. No one suffered injuries during the shooting. Detectives believe the incident was gang related, and their investigation led them to a suspect living in the 1300 block of 18th Street in Oceano. At about 4 a.m. Friday, the Sheriff’s Special Enforcement Detail, the regional SWAT team and members of the Sheriff’s Gang Task Force served a warrant at the Oceano home. A CHP helicopter, a sheriff’s K9 and a Fish and Wildlife K9 that is specially trained to detect firearms also provided assistance. Upon serving the warrant, authorities found a loaded handgun, rifles, shotguns, large amounts of ammunition for various handguns and illegal high capacity magazines that were loaded, according to the sheriff’s office. Investigators also found methamphetamine for sale, a couple thousand dollars in cash and evidence of firearms sales. 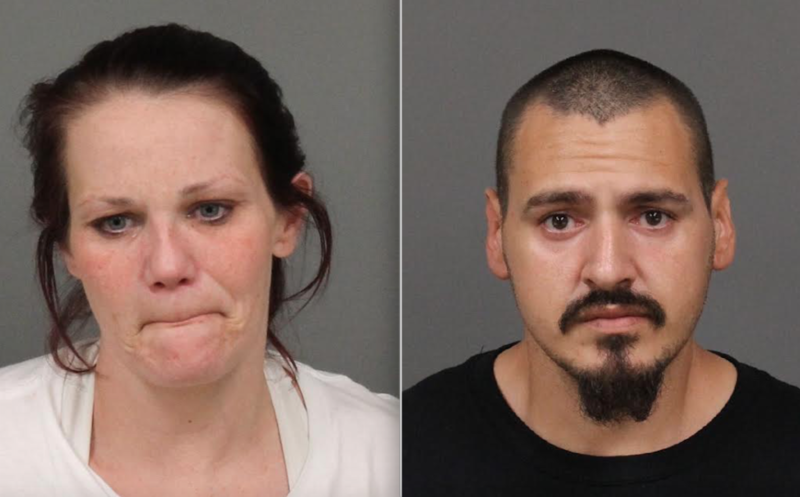 Deputies arrested Juancarlos Montano, 33, and Dusty Michelle Dickerson, 34, and booked them in San Luis Obispo County Jail. Montano and Dickerson are both facing charges of possession of a controlled substance for sale, conspiracy to commit a crime, committing a drug offense near a school, possession of ammunition by a prohibited person, being a felon in possession of a firearm and possession of a controlled substance while armed with a loaded firearm. Both Montano and Dickerson remain in custody with their bail set at $50,000.